Featured Property: Lake Placid Home on Ski Trails! I was on a long, slow-distance training run today when I realized I have not written about the homestead, my home in Lake Placid which is for sale, in a long time. I remembered this because I was thinking about how neat it was that I was running on the very same terrain used by Olympic athletes in the 1980 Lake Placid Olympic Winter Games. More importantly, I was pondering how much work I have to accomplish and how it is a good thing I can conveniently and quickly access this world-class trail system from my very own back yard. Then it really hit me - we will be moving in the not too distant future! As some of my regular blog readers may recall, the resident biologist and I are building a new home. 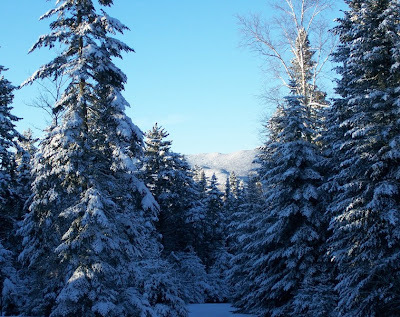 The Adirondack real estate market is currently very active, more and more people are viewing our house, so I wanted to let my loyal readers know in the event anyone is looking for a charming Adirondack home. The property is on two acres of land adjacent to Forever Wild New York State land, our trails connect to the Olympic trails at Mount Van Hoevenberg, and it is on the Ironman bike course. This really is an outdoor enthusiast's dream spot and I'd love to see someone in it who appreciates the wonders and benefits of nature and the outdoors. Let me know if you'd like to hear more, but do it soon since I don't think it will be available much longer!